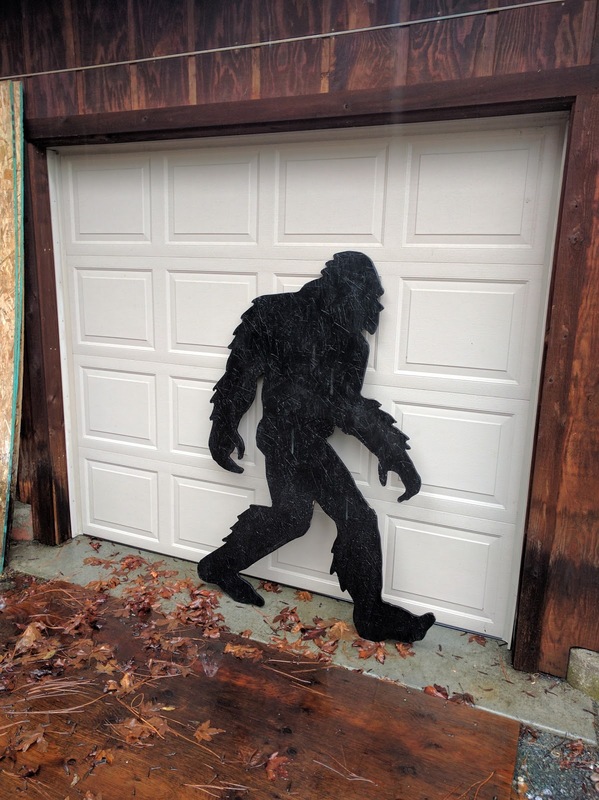 It's hard to visit Southern Oregon without encountering Bigfoot, aka Sasquatch a few times. This is his home stomping ground, after all. There are several companies that sell yard silhouettes of one sort or another. They all work the same way: You buy a full-sized printed template, trace it with carbon paper onto wood, then cut it out and paint it. I bought this one from Doug's Woodcrafts and Patterns of Edmonton, Alberta. He sells dozens of patterns, including sea lions, buffalo, cowboys and ballroom dancers, among others. 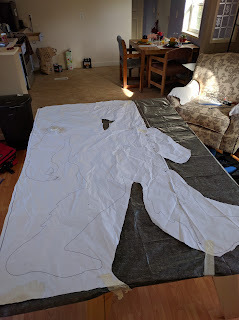 Most cost 15-30 dollars, and include both the pattern and the tracing paper. You just supply the wood and paint. Mine is from pattern 1-101, a 66" walking Sasquatch. He also sells 1-102, a standing version. If I had it to do again, though, I'd probably select DT-103, a larger one that stands a menacing 96" tall. Next time, maybe. The pattern and tracing paper can both be used several times. After doing my own, I did another one for a friend. This is how it went at our home in Bandon, Oregon. Most people will choose a 4 foot by 8 foot piece of plywood. It comes in various thicknesses and grades. Grade A is the best. You can buy sheets with different grades on each side, so you're not paying the big bucks for a side that's not seen. 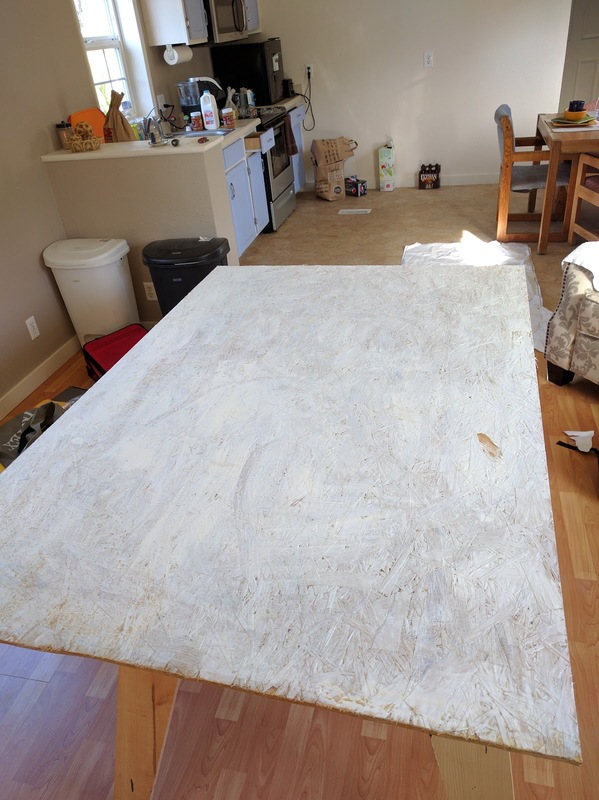 Being even cheaper than that, I used "OSB," Oriented Strand Board, instead. It's similar to plywood, but uses flakes and odd-shaped pieces instead of smooth panels. Like plywood, it's glued together and is quite strong. I used masking tape to hold the pattern in place, but none is needed on the carbon paper, which is held in place by the pattern above it. As seen here, the pattern is wrinkled, but that's from leaving it out in the rain once. As received it was smooth and pristine. You carefully trace the pattern, using some kind of stylus. I like the capped end of a "Sharpie" marker. It's blunt enough not to tear the paper and leaves a wide line that's easy to follow. 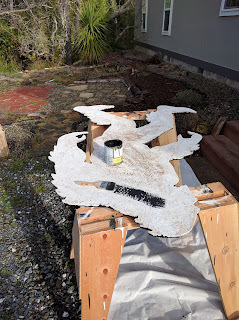 Once the tracing is done, it's time to move outside, because the rest of the project is pretty dusty. You don't need to be any kind of a skilled carpenter. Just be careful. 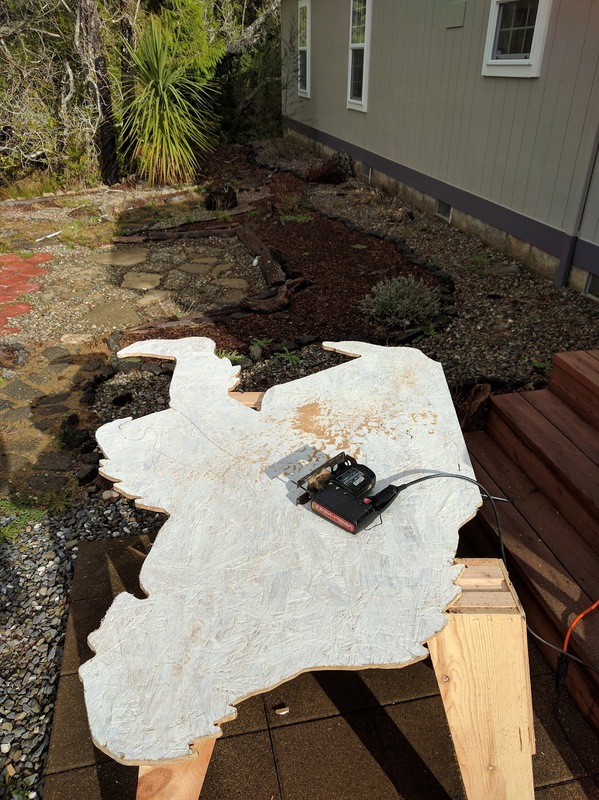 I used an electric jigsaw. There are different blades for these, for cutting different materials. A "Finish Carpentry" blade is the best here, because it makes a smooth cut and is easily maneuvered to follow the pattern. Of course, always wear both eye and ear protection when using power tools. You can see that his rear-most leg is traced, but not yet cut. That's the jigsaw I used, but any kind is suitable. You need to use something to support him during the cutting. I chose two inexpensive wooden sawhorses. Among other things, one doesn't feel too badly about cutting into them by accident or dripping paint on them. One of the distinctive things in this pattern is that some outcroppings are curved, while others come to a point. The jigsaw easily tracks around even fairly-tight curves. (Though you have to slow down, and the added friction when turning sometimes makes the wood smoke.) If you have a V-shape that you need to leave, though, it's better to make two separate cuts that meet at the point of the V. You can't get a sharp corner like that just by twisting the saw. After cutting, you should sand both sides of the wood and around the edges. I used an electric "detail sander," which uses 1/4 of a standard sheet of sandpaper and is easy to hold. It won't fit in the very tightest places, but it gets into most of the nooks and crannies in this pattern. The final step is painting. Use whatever color you like, but the traditional one is flat black. Be sure to use an outdoor-rated paint. A one-quart can will easily handle more than one silhouette. Paint the back side first. When it's dry, turn 'Squatch over and paint the front. Last of all, paint around all the edges. I found that one coat was OK for the back and sides, but covering the white paint on the front took two coats. Timewise, the tracing took perhaps half an hour, taking my time to get it right. (Remember to mark where you started so you'll know when you finish!). Cutting took as much as two hours, and it's best to break it up into a couple of sessions. I found that making a rough cut around the figure made the precision cutting afterwards easier. Perhaps it's closer to cake mix than to scratch-made-bread, but there's still pleasure to be taken in a project of one's own. Next up is the traditional glowing red eye for him. I'll report on that when finished.